Visitors who wish to stay overnight at the park may camp at one of the 142 campsites on the pond's northern shore. 130 of the sites are equipped with water and electric hookups. 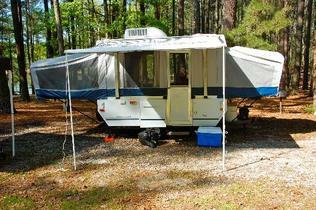 Tents and recreational vehicles can both be accommodated beneath the tall loblolly pines. Two primitive camping areas are also available for youth groups by reservation only. The rustic 2-room camping cabins at Trap Pond have a wonderful location next to the water. Enter the cabin at the screened-in porch and move inside to the living area with table, benches and chairs. The bedroom has a double bed and bunk beds to sleep four adults. The units have A/C and heat for 3-season comfort, and offer a great camping experience with protection from the weather. A picnic table, grill and potable water are located outside, and campers will find convenient bath and shower facilities nearby. The cabins are available from March 1 through November 30, and may be rented for any number of nights up to 14 days. Weekend reservations must include Friday and Saturday nights. Holiday weekends require a minimum stay of three nights (Friday through Sunday). Reservations are accepted up to 7 months prior to the date of arrival. Since animals are not allowed in cabins, campers should not bring their pets. Yurts are round stationary structures with canvas walls that feature: a single and double bed bunked together, a double bed size futon, an outdoor seating area, and outdoor deck. Yurts are a fun and easy alternative to pitching a tent yourself, but still allow you to experience the rustic feel of camping outdoors. Perfect for the new camper! Maximum 5 people per yurt. The yurts are available March 1 through November 30, with a maximum stay of two consecutive weeks. Weekend reservations must include two nights -- Friday and Saturday, OR Saturday and Sunday. All other times of the year, yurts may be rented for any number of nights up to 14 days. Reservations are accepted up to 7 months prior to the date of arrival. Since animals are not allowed in yurts, guests should leave their pets at home. Parking is located within a short walking distance of the yurts. Cars may not be driven directly to the sites. Handcarts are available for transporting luggage from the parking area to the campsites. Tents are not permitted on yurt campsites. The Trap Pond Partners is a 501(c)(3) nonprofit organization. ©2019 Trap Pond Partners, LLC, All Rights Reserved.